Excerpted from my Homily at the Freedom & Joy Retreat (Sisters of Life) for the 16th Sunday of Ordinary Time (Sunday July 19, 2015). I remember reading a story once where a very ardent and prolific atheist indicated that the decisive moment for him, when he realized there was no God was looking at a magazine cover, of a woman looking up to heaven with her dead child in her arms. She cried out to God, “Why?” In this moment, he walked away from a faith in an irrelevant God. The author went on to make a very significant counter-argument; was it an irrelevant or distant God who made the decision not to intervene in the life of this child? Or was it a world with more than enough, leaders, governments and decision-makers who in their own comfort care little for people in different regions of the world? Is it bureaucratic red-tape that contributes to starvation and famine; indifference in the heart of many? Throughout all of human history, God has been sending forth leaders to “shepherd” His people, and throughout that history, many a shepherd have put themselves and their own interests or the interests of a few before the care of the entire flock. This continues to this very day. So God sent His Son, the Good Shepherd, who gave absolutely everything of Himself for the sake of the sheep. He worked tirelessly as today’s Gospel offers us, even putting the care and love of His people before His own rest and recuperation. 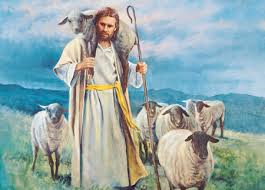 The Good Shepherd has throughout history since His Incarnation and through His Apostles and disciples, “shepherds after His own heart”, left the 99 safely and gone after the “one lost sheep”. I am one of those sheep, I am one of those sheep who was found. Active discipleship, lived out in every earnest vocation, requires that we be shepherd to people, we are all sheep following the voice of the Good Shepherd, but we will all shepherd others – that is the work of a disciple! Let us consider our role as shepherd and accept the awesome responsibility of it all; let us work tirelessly for a world with more sheep with a shepherd.